A newly constructed red-brick luxury rental building located at the cross-section of Houston St. and Chrystie Street on the Lower East Side, Chrystie Place has played a major role in revitalizing the neighborhood. Built in 2005, the post-war luxury building stands 14-stories tall and has an appealing red-brick exterior with a set-back tower on the 9th floor. 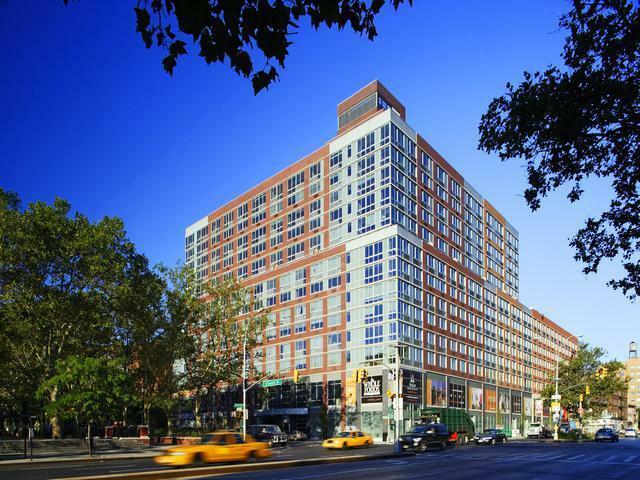 Chrystie Place is also home to multiple retail stores on the lower levels, including a Whole Foods on the 1st and 2nd floor. The combination of modern design in a gritty neighborhood makes Chrystie Place unique among luxury rentals in the current Manhattan listings. The 361 luxury apartments in Chrystie Place are modern spaces that utilize open layouts and sunlight to the fullest extent possible. These spacious studio, one-bedroom, and two-bedroom apartments boast floor-to-ceiling windows and parquet hardwood floors. The gourmet kitchens feature granite counters, custom cabinetry, and dishwashers. Additionally, residents will enjoy the convenience of remote-controlled window-darkening blinds and programmable heating and air-conditioning. Some of the luxury apartments in Avalon Bowery Place also boast private balconies. The amenities package at Chrystie Place includes 24-hour concierge service, a roof-deck, and a gated entrance with controlled access. Chrystie Place also features multiple exclusive BBQ and picnic areas. Chrystie Place is a pet-friendly luxury rental with a residents lounge and an adjacent recreational facility with competition-sized swimming pool and a state-of-the-art fitness center. Residents of Chrystie Place will also enjoy a choice location; not only is this newly constructed luxury rental building located in the Lower East Side, one of Manhattan’s most exciting neighborhoods, it also borders chic neighborhoods such as the East Village, SoHo, and NoLita. I would like information on apartments in Chrystie Place. Please contact me ASAP.